Are you looking for a soothing, luxurious massage that eases muscles and calms the mind? 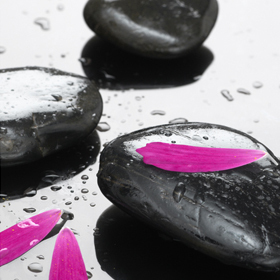 Relax and heal the body with a warm and calming massage using the unique detoxification properties of heated basalt and marble natural stones. Your trained massage therapist adapts every routine to your body with a range of stones and strokes in a soothing treatment that dates back to the healers of ancient China and India. Treatments are offered 30 minutes for back massage and 60 minutes for full body including back, legs, arms, face, shoulders, feet and chest. Are you looking for a deep massage combining working out knots with a luxury-feel treatment? Treatments are offered 30 minutes for back massage and 50 minutes for full body including back, legs, arms, shoulders and chest.